Easy 30 Day Returns Hassle Free! Exclusive CLEARANCE Items! Click Here. Order Now, Delay Free Shipping. Call for details. 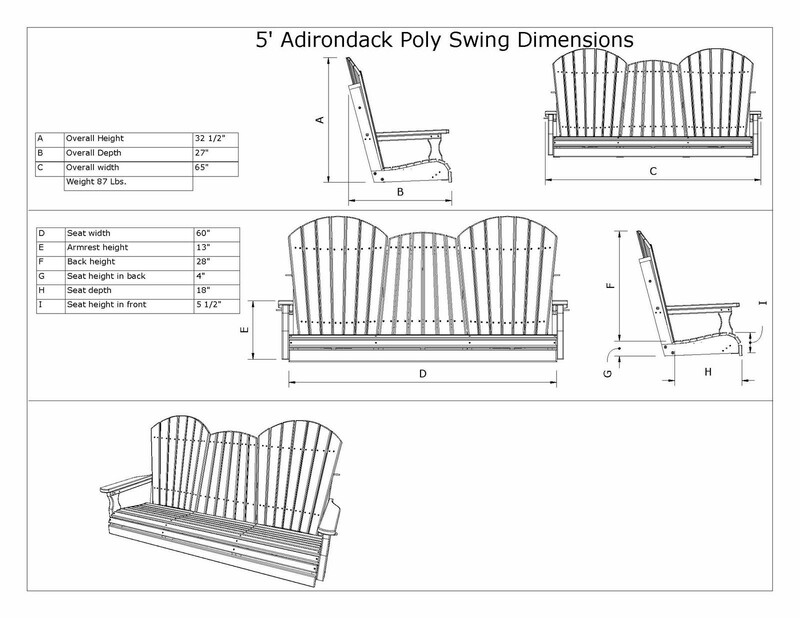 Adirondack Swings offer a fun, timeless look to your backyard, porch, lake house or patio. Need Trade or Hospitality Pricing? Click Here. 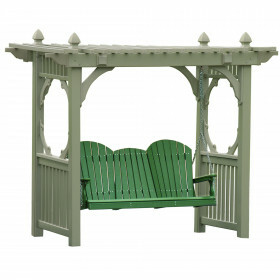 Adirondack Swings offer a fun, timeless look to your backyard, porch, lake house or patio. The Luxcraft / Crestville® 5 Ft. Adirondack Swing sports a contoured seat with roll out for added comfort while you swing in the sweet summer breeze. 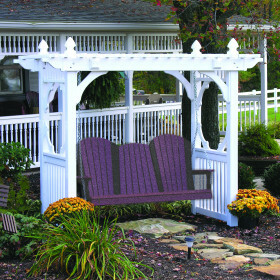 Constructed from recycled HDPE plastic the Luxcraft / Crestville® 5 Ft. Adirondack Swing will not rot, corrode or splinter and even better because of the weather resistant properties of this adirondack swing you will not need to sand, paint or refinish it to keep it looking new year after year. You have a choice of solid colors or two tones to express yourself even in your outdoor furniture. 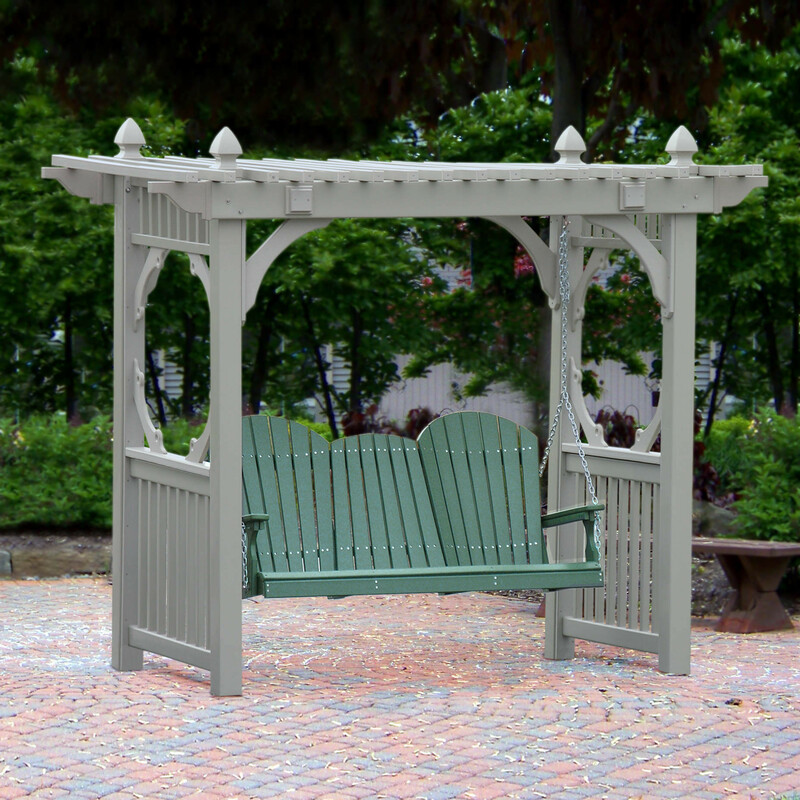 You can count on quality construction and superior workmanship from the Luxcraft / Crestville® 5 Ft. Adirondack Swing. The swing is very high quality. The instructions and the labeling are definitely a help and show the concern for their customer. Note that the chain is cut for a 9 ft. max height. I had to go to a local hardware store to get additional chain to replace the short pieces. I would suggest the factory consider adding a #2 square bit with the package of screws, in case others do not have one. It is much easier using a power screw driver. Love this swing. Quality is great, shipped and received quickly. Assembly fairly easy. Great company to deal with Purchased matching pieces. Love the swings! Very good quality, shipped quickly and a great price. First one took a little long to put together but the second one went very quick. All pieces are numbered so easy assembly. We couldn’t be happier with this swing. The Luxcraft Crestville® Adirondack 5 ft. Swing. We have owned two wooden swings in the past and both lasted only 5 to 7 years. Packaging and shipping where excellent. I am glad that I went with the stainless steel chain and the Crestville Stationary cup holder; I have just ordered a second cup holder. [ I am not sure that the Luxcraft PCH Cup holder would work on this arm] The swing was easy to assemble. The instructions could have been a little clearer on where/how to install the washers. I am so thankful that the chain was prea-ssembled at just the right angle. I never would have had the swing set up with as much back tilt. However Luxcraft knew what they were doing as the angle and the swing are extremely comfortable. We are looking for the swing to outlive us. Good stuff, but a little expensive. Very nice. Well made and shipped quickly. Swing was very easy to put together. Looking forward to many years of service.good stuff. I was very pleased with my swing. It came very quickly and was easy to assemble. The quality was what I seen in the stores but it was a better value for my money. Plus in the store was a 3 week wait. Mine came in 5days. These are beautiful, well made and they shipped very fast. They are a bit pricey but hope they last for many many years. about our company or products. © Copyright 1998-2019 - Premium Poly Patios. All Rights Reserved.